In the nineteenth century, mass entertainment is principally performances in public places such as concert halls, opera houses, theaters or open-air public areas. Given the space restrictions, mass entertainment cannot be truly mass popular culture. In the twentieth century, a major mass popular cultural product was the movie film which can be exhibited in many cinemas through the mechanical reproduction of film copies. In time, the VHS video recorder was introduced, thus permitting consumers to buy/rent movies that can be shown in their own homes. More recently, the newest technology for film distribution is the DVD player, which leads to crisper, clearer movies stored on a more durable medium. A new technology rarely displaces another technology in total immediately. In the interregnum, the old and the new co-exist with the one declining and the other gaining. The speed of the diffusion of technological innovations depends on a number of factors. The producers can exert some degree of control (through distribution, quality and pricing), but the users are the ultimate decision-makers. We will now cite some survey data from the TGI Mexico study. This is a survey of 6,200 persons between the ages of 12 to 64 years old conducted during the first half of 2002. Of these respondents, 18.8% said someone in their households had purchased VHS cassette tapes in the last 6 months and 3.3% said someone in their households had purchased DVD discs in the last 6 months. At this moment in time, VHS has a market volume that is six times as large as DVD. We will note that these purchase rates include both officially sanctioned products as well as pirated copies. In the case of VHS tapes, one might suspect that the pirated copies dominate whereas DVD piracy is not yet endemic. In the next chart, we show the incidences by geographical areas in Mexico. Outside of the three named metropolitan areas, the TGI Mexico study covers 26 other cities with population size of 400,000 or more. 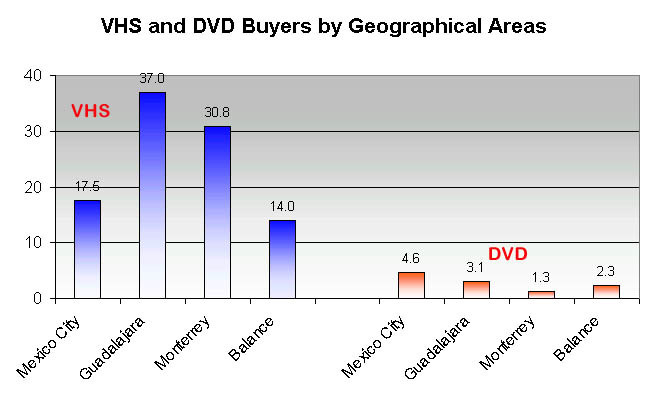 The chart points to DVD purchase is highest in Mexico City, which is logical because it has the largest and most sophisticated population base. 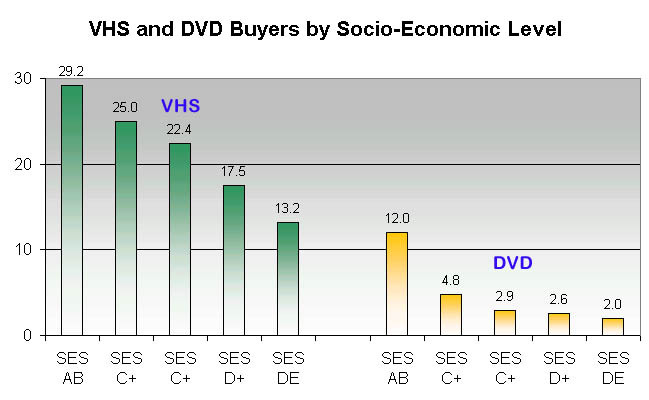 In the next chart, we show the purchase incidences of VHS and DVD by socio-economic level. Since these are discretionary consumer items, it is not surpsing that the purchase rates are monotonic functions of socio-economic level. This chart would be most interesting if we had more than one observation in a time series. We can visualize that, in future years, that DVD sales will eventually surpase VHS sales, first among the SES AB group and then down the line. As it stands, if the ratio of VHS-to-DVD is 18.8%-to-3.3% in the total population, it is alread 29.2%-to-12.0% within SES AB. In the last chart, we show the purchase incidences by the age of head of household. If there is a transition, then it has already occurred among younger people. 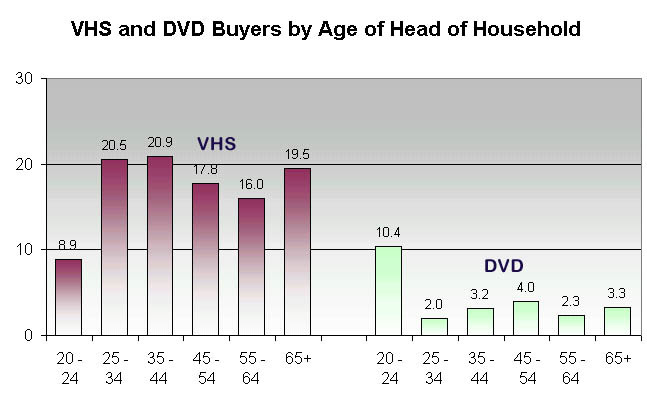 Within the 20-24 years old group, the VHS-to-DVD ratio is 8.9%-to-10.4%, with DVD already ahead.